One night last week my smallest child was doing his best to avoid going to bed. Off he went to bed, but every time I even looked liked I was going to take of my glasses his eyes shot open. “Leave. Them. On!” he demanded. By this stage I would have stood on my head if it helped him get to sleep so I left the snazzy green glasses on and took a quick instagram selfie to record the moment for posterity. As I read through the funny facebook and instagram comments my obsession with printables flared and I decided then and there that I needed to make some crazy printable glasses to go with my stunning green pair. Since then my study has been littered with scraps of paper and glasses prototypes, and, after much trial and error, I finally got them right! 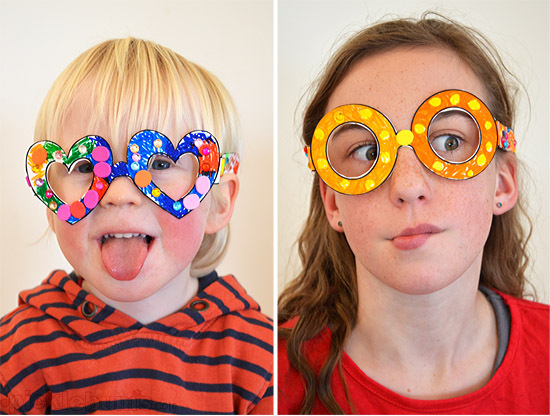 This afternoon my four kids sat down to make crazy glasses! To make your own crazy glasses all you need is my free printable crazy glasses template, which you can download here. Then just print the two page pdf. You can either print straight onto some strong card, or print them on to regular paper and paste the pages onto some old cereal boxes or similar cardboard for support. Choose your glasses and cut them out along with a set of arms. Measure how long the arms of the glasses need to be to comfortably fit your head and snip them off at the desired length. Fold the little tabs on the side of the glasses and tape the arms onto them. Now all you need to do is decorate your crazy glasses and take your own crazy photos! 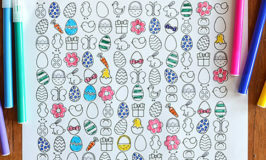 Find more of our fun, free printables here. These are fantastic! My kids will DEFINITELY like this one! Glamourama! Except, hmmm…. I see no photo of *you* wearing the glasses? I love these Kate…thanks so much for the printable!! Those pics are so funny by the way! I know.. I love those photos! Apparently that’s what you get when you ask my kids to make a crazy face! Bingo! These is our school holidays activity today! thank-you!! OK, you’ve done it again — made me use more of my expensive printer ink, LOL! Seriously, your blog is great and I look forward to seeing it in my e-mail. I believe I already posted a comment that I would be printing out items to put in Christmas shoeboxes (a project of Samaritans Purse) and these will definitely make for a great do-it-yourself, inexpensive fun project for me to include. Thanks so much for the wonderful free printables and the fantastic instructions. Oh, and your kids are great models! Loved the template for the glasses! I do a self-portrait lesson with my first graders using glasses cut with our Accu-cut machine. This will be so much better since the students can choose different shapes! Thanks so much! Came across your cute glasses on Pinterest. Thanks for sharing! My kids will love decorating these! Hi, I’m a children’s librarian and will be using these for a Pete the Cat storytime soon! thanks!! 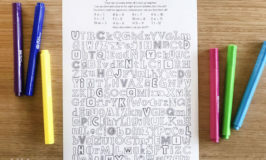 The kids at my library will love to do these as a craft! Thanks! What fun! These will be great to make this summer! Thank you so much! 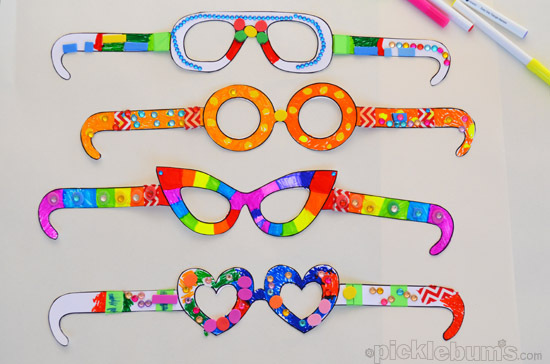 These cute printable glasses made getting ready for story and craft time at the library a cinch! We are reading Pete stories. I will end with the Magic Sunglasses and we will make our own stunning glasses to top things off! So cute! I’m linking to this page of yours for an upcoming blog post of my own. I hope you see some new visitors come your way! Thank you for the eyeglass patterns… Love it. Thank you so much, I am using these in my 2nd grade classroom to help kiddos to monitor and clarify what they read!! Thank you so much for these! The kids in my class had so much fun creating them and we are going to use it as a prop for the narrators for our Reader’s Theatre! Thank you so much for these I’m in charge of babysitting five little kids on New Years Eve and this is a perfect project for them to do! 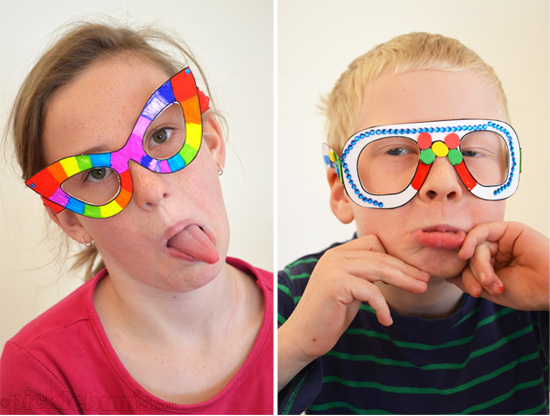 Home » Free Printable Crazy Glasses!